PM Nguyen Xuan Phuc and his Lao counterpart Thongloun Sisoulith witnessed the signing of 12 cooperative documents at the 40th meeting of the Viet Nam-Laos Inter-governmental Committee. The two Vietnamese and Lao PMs co-chaired the meeting on February 5 in Vientiane, Laos. This was the second time they jointly presided over the meeting, highlighting the determination of Vietnamese and Lao high-ranking leaders to effectively implementing cooperative deals in 2018. Lao PM Thongloun Sisoulith warmly welcomed his Vietnamese counterpart and the Vietnamese high-ranking delegation; congratulated Viet Nam on its important socio-economic achievements in 2017. He also took the occasion to thank the Party, State, Government, and people of Viet Nam for their immense assistance for the revolutionary cause of Lao people. Mr. Thongloun Sisoulith highly valued the significance of the meeting especially after the two countries successfully celebrated the Viet Nam-Laos Solidarity and Friendship Year 2017, the 55th anniversary of diplomatic ties, the 40th anniversary of the Treaty on Friendship and Cooperation. The PM was convinced that the meeting would contribute to cementing and deepening the bilateral ties in a practical manner and elevate the bilateral ties to a new height. 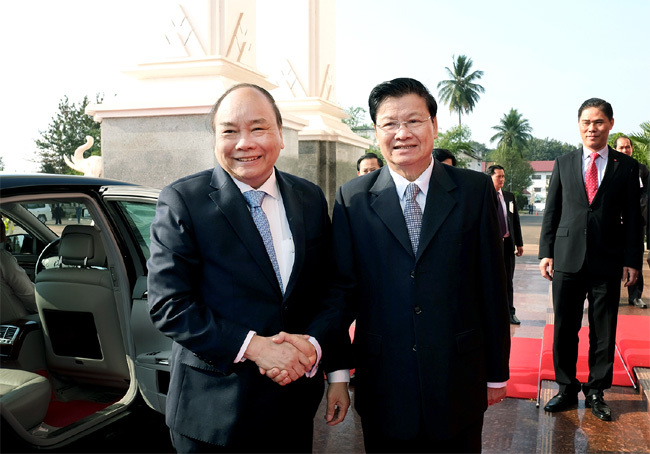 PM Phuc thanked his Lao counterpart for warmly welcome and brotherhood sentiment. He emphasized the special relations between Viet Nam and Laos which have been unceasingly nurtured and developed. Viet Nam always spares no effort to cement and deepen the close and effective relations in all fields, affirmed the Government chief. Last year, the two countries fruitfully organized the Viet Nam-Laos Solidarity and Friendship Year 2017. The cooperation in politics, diplomacy, security, national defense, people-to-people, and education was strengthened. Over 14,000 Lao students and pupils are studying in Viet Nam. So far, Vietnamese enterprises invested over US$ 3.7 billion in 411 projects and FDI disbursement hit over US$ 1.6 billion. Two-way trade turnover valued over US$ 935 million, equivalent to 13.6% of the figures recorded last year. In 2018, the two sides agreed to implement Joint Declarations and Agreements; promote cooperation in all fields, especially strive for a 10% growth rate of two-way trade turnover; sustainable water management, and natural resources. The two countries pledged to support and cooperate with each other at regional and international organizations and forums. The two PMs also witnessed the signing ceremony of 12 cooperative documents including an Agreement on a cooperative plan between the two Governments in 2018; the minutes of the 40th meeting of the Viet Nam-Laos Government, an Agreement on Vung Ang investment cooperation, and some documents among ministries, localities, and businesses./.